Bill C-45 will legalize and regulate access to cannabis in Canada. Its intent is to permit the legal sale of cannabis while providing a public health framework to help reduce the negative health and social outcomes related to cannabis use while rectifying the serious negative effects resulting from the criminalization of cannabis possession. 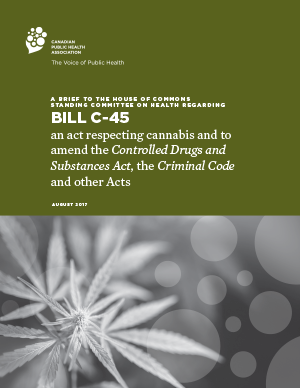 Bill C-45 also proposes changes to the impaired driving laws with the purpose of more severely punishing those who drive while under the influence of any drug, including cannabis, and prohibits the smoking and vaping of cannabis in federally-regulated places and conveyances. Furthermore, the 2017 Federal Budget provided funding to support cannabis-related public education programs and surveillance activities. The Canadian Public Health Association (CPHA) has presented a description of the issues that should be addressed in any cannabis legislation and regulations if a public health approach is to be achieved. Many of the provisions contained in the draft legislation resonate with our proposals. As such, CPHA commends the federal government for this important step in developing a public health approach to addressing cannabis use in Canada. Bill C-45 also delineates areas of federal and provincial/territorial (FPT) authority. Further efforts should be undertaken to develop this legislation, and the associated regulations and guidelines to minimize inter-provincial variations in approaches. CPHA recognizes the complex inter-relationships of federal, provincial, municipal and Indigenous governance authorities that exist concerning the regulation and sale of alcohol and tobacco, as well as the precedents and constitutional authorities that support those regimes. We also realize that these authorities need to be respected in structuring cannabis-related legislation and supporting regulations. This initiative, however, is a rare opportunity to develop a control system that respects FPT and Indigenous governance rights while providing consistent pan-Canadian regulation. Topics related to Bill C-45 that require further consideration are addressed below. This section will result in the crime of possession for the purposes of selling becoming an indictable offence punishable with up to 14 years in prison for those convicted, including young people between the ages of 12 and 18. Section 8 concerning Possession and Section 9 concerning Distribution provide similar sentencing options for people over 18 years of age, but permit referral to sentencing under the Youth Criminal Justice Act for those between 12 and 18. CPHA’s viewpoint is that an option for sentencing under the Youth Criminal Justice Act for young people should also exist under Section 10(5). In many cases this offense is related to possession for sale by young people to their peers, and the stigma established by such a conviction may cause irreparable harm to their futures, outweighing the actual offense. Care should be taken to apply the proposed rules concerning possession for the purposes of sale to reflect the severity of the crime. Canada’s Marijuana for Medical Purposes Regulations (MMR) permit cannabis consumption for medical purposes with strict regulations on licensing, growing, and distribution, and would appear to continue under the proposed legislation. The report from the Canadian Centre for Substance Use and Addiction (CCSA) study tour of Colorado, a state that supports both retail and medical cannabis regulatory systems, noted the confusion and overlap resulting from maintaining parallel systems. As such, it is CPHA’s position that the current MMR should be amended such that they are applicable only in specific situations. CPHA recognizes that certain patients under the legal age for purchase may require access to cannabis, and that other patients may require higher tetrahydrocannabinol (THC) concentrations for treatment than might be accessible through the retail system. For these patients, exceptions to the new legislative and regulatory framework may be required. Patients younger than the designated legal age in their jurisdiction should have access, with their physician’s recommendation, to specific cannabis-containing products when other treatments have been unsuccessful. Similarly, CPHA recognizes that certain patients may require more potent forms of cannabis than would be available through the retail system. Distribution of these specialized products should be restricted to those with medical requirements and be produced by authorized manufacturers. We look forward to a transparent and inclusive consultation process leading to regulations that embody public health principles. Health promotion - to support healthier and safer behaviours, beyond the use of labelling and packaging (subsection f) and promotion (subsections n, o and p). Prevention and harm reduction - to prevent or delay the onset of use and to reduce the likelihood of harm from use, problematic use and/or overdose – beyond the establishment of THC levels (subsection k). Addressing population health assessment - to understand the extent of cannabis consumption, and measure the potential impact of the interventions, policies, and programs on the population. Strengthening individual health surveillance - to understand the effect on society and evaluate the effects of cannabis use. Providing for evidence-informed services - to help people who are at risk of developing, or have problems associated with cannabis use (and/or other psychoactive substances). These approaches must be based on the best available information of what works, what is likely to work and what does not work. As such, CPHA also calls upon the federal government to support, develop and implement research programs, including cross-jurisdictional research, that address all aspects of cannabis use, with priorities developed by the Canadian Institutes of Health Research. Underpinning these initiatives is a requirement for an evaluation plan that provides timely assessment of what works and what is not working so that adjustments can be made. Public health is an approach to maintaining and improving the health of populations that is based on the principles of social justice, attention to human rights and equity, and evidence-informed policy and practice, and addresses the underlying determinants of health. It places health promotion (based on the Ottawa Charter for Health Promotion), health protection, population health surveillance, and the prevention of death, disease, injury and disability as the central tenets of all related initiatives. It also bases those initiatives on evidence of what works or shows promise of working. This type of approach is organized, comprehensive, and multi-sectoral. It emphasizes pragmatic initiatives and takes into consideration efficiency and sustainability. A public health approach recognizes that problematic substance use is often symptomatic of underlying psychological, social, or health issues and inequities. As such, it includes the perspective of people who use psychoactive substances or are affected by problematic use. Vital to this approach is the concept that those who work with people affected by, or on issues concerning, psychoactive substances have the necessary education, training and skills to understand and respond to the needs both of people who use these substances and of their families. This knowledge base includes understanding the relationship between substance use and physical and mental disorders. A public health approach also ensures that a continuum of interventions, policies, and programs are implemented that are attentive to the potential benefits and harms of substances, as well as the unintended effects of the policies and laws implemented to manage them. The goal is to promote the health and wellness of all members of a population and reduce inequities within the population, while ensuring that the harms associated with interventions and laws are not disproportionate to the harms of the substances themselves. The Canadian Centre on Substance Use and Addiction identified the motivational factors for youth cannabis use as being: excitement, social pressure, coping, conformity, and increased understanding. In addition, youth generally receive conflicting messages from their peers, media, teachers and parents/guardians concerning the harms that may result from the consumption of cannabis products. As a result, youth generally view cannabis use as relatively harmless; this viewpoint must be considered when establishing related legislation and regulations. It should also be recognized that there is a near-complete ban on tobacco advertising, and that alcohol products have restrictions on advertising. Such approaches should be used as examples for any control mechanisms developed for the marketing and advertising of cannabis products. Careful consideration needs to be given to taxation and pricing. The challenge will be both to determine the price elasticity for these newly-controlled products, and to establish a price point that reflects product cost, profit margins and a taxation rate that acts as a deterrent to sale, particularly for youth, while limiting the potential of maintaining an illegal market. Examples of such pricing can be found for the sale of alcohol and of tobacco. In both cases, taxation is used as a deterrent to sales, however, arguments can be made that further increases in the taxation rates for alcohol and tobacco are no longer effective at reducing sales. It should also be noted that, in the United States, the tax rate on cannabis products varies across states; Washington State’s current tax rate is 44%, while the rate in Denver, Colorado is 29%. A final consideration is that the marketplace for cannabis may see the development of a variety of products with varying levels of THC with different levels of risk. As such, consideration should be given to establishing tax rates for such products based on their THC concentration. There are a variety of products with varying levels of THC that may be offered for sale. It is also noted that THC concentration has been on an upward trend over the last decade, from 3% to 16% or higher. Limitations are required on THC concentrations for all cannabis-related products. For the dried product, a maximum THC concentration of 15% should be established. This level is based on THC levels in the current products, and the levels established by Colorado and Washington states. Governments should take steps to inform citizens of the potential harms associated with the consumption of cannabis and cannabis-containing products, as well as safe consumption practices. These could include: prohibition of general advertising for cannabis-containing products, similar to that required for tobacco products, as well as the proposed plain packaging requirements. Limitations should be placed on the use of corporate logos and graphics on packaging and advertising materials. Also, mandated labelling requirements should be considered that include evidence-informed health warnings and contraindications, as required for beer, wine and spirits (should the evidence support the designations), and information on where to access support services.